Here is a cancelled dinosaur stamp I found in my collection. It was part of set of 4 dinosaur/reptile stamps the U.S. Postal Service released in 1989. 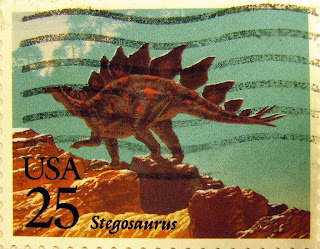 The animals they selected were the Tyrannosaurus, Stegosaurus, and Brontosaurus (Apatosaurus shown on stamp). The fourth animal on the stamps was the Pteranodon which is not a dinosaur but a flying reptile. The Stegosaurus was a dinosaur found in the Late Jurassic Period. According to Wikipedia, its name means "roof lizard". Earlier I posted the Tyrannosaurus stamp HERE.